Calum MacLean works as a freelance hitman in Glasgow’s underground. Thoughtful and careful he’s worked out how to operate efficiently, effectively and below the radar. When Frank MacLeod, the resident gun for Peter Jamieson, needs a hip replacement, MacLean is the obvious person to fill his shoes. His first job is to dispose of Lewis Winter, a drug dealer who is expanding his operation into Jamieson’s territory with the help of someone else. A message needs to be sent and MacLean is the man to do it. 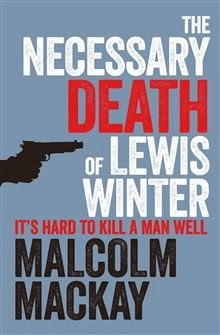 I’ve read a number of positive reviews of The Necessary Death of Lewis Winter so I thought I’d give it a go. The story focuses on MacLean’s life as a hitman, setting out his observations as to what makes a successful career, his worries about being drawn into an organisation rather than operating as a freelance, and the lead up and aftermath of killing Lewis Winter. The tale has its moments and the almost documentary style narrative is an interesting approach. However, sometimes a book clicks for a reader and other times it doesn’t and I never really warmed to the story. Mackay’s writing voice felt too detached, there was no sense of place and story could have been happening anywhere, and I never built an emotional connection to the characters or the tale. 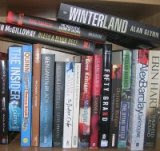 As a consequence, although the book has it merits it unfortunately left me a little cold.